THE KANSAS CITY ROYALS ARE ON SUNDAY NIGHT BASEBALL!!! I wonder if that sentence has ever been written before. The Phillies are out of it and Team Phungo will need to look elsewhere for playoff baseball this season. One of the teams we will be rooting for is the KC Royals. Hopefully their long playoff drought will end in 2014 and their fans will get to experience October baseball for the first time in about a generation. Beyond their playoff exile the other reason I can get behind the Royals is they have a local minor league (Lo-A) affiliate, The Wilmington Blue Rocks. In recent years I have made it to about one Blue Rocks game a year. Consequently the names of some of their players are familiar to me. Those players include Mike Moustakas, Chrstistian Colon, and Kelvin Herrera. Alex Gordon bypassed Wilmington during his accelerated ascent to the majors, but he did play a handful of games with the Blue Rocks in 2010 when he was experiencing a prolonged slump. He has had an odd career. In 2005 Gordon was the #2 overall pick in the MLB draft, he was in the majors by 2007 (but not 2006 - see below). He was a big enough star that Topps made buffoons of themselves over him. After a decent sophomore effort in 2008 at age 24, Gordon's career tanked. This hit bottom in 2010 when he found himself all the way back in A ball. Somewhere in there The Royals moved Alex Gordon from 3rd base to the left field. This is where he has become an all-star. He has won 3 gold gloves at his new position and his offensive production has reached a point expected of a high first round pick. Currently his 5.6 combined WAR ranks 3rd among AL position players. He has a healthy .283/.356/.457 slash line yielding a 124 OPS+. His 17 Homers and 61 RBI lead the Royals. Hopefully his offensive production continues down the stretch and he can help the Royals reach the Postseason. It is hard for me to believe that the MLB/MLBPA Rookie Card guidelines have been in effect for eight years. Basically the MLB rules stipulate that a player must have played in a Major League game prior to appearing on a baseball card. For reasons I don't understand minor league centered sets like Bowman fall outside this realm. When the new RC standards were introduced in 2006 there was a controversy over the Topps #297 Alex Gordon card. The card was included in the base set, including Rookie Card Logo, but Gordon hadn't yet reached the majors. Topps withdrew the card. I believe Topps has stated "it was an honest mistake" when discussing the card. They didn't say that it was a Publicity Grab to whip the media into a frenzy in the hopes that billions of people will start buying baseball cards again. Regardless Topps withdrew the cards which is unfortunate for set collectors, because unless they have very deep pockets for a singular card oddity (or they are Keith Olbermann) they will have a gaping hole in their 2006 Topps Complete set. Or they can just use this CYMTO card. One oddity about the CYMTO Gordon is the 2nd Topps logo. The Red logo in the top right is what appeared on the original 2006 Topps card. The ghosted grey one just upward of middle left is on the CYMTO card only. The Phillies 2014 season is in a shambles and we have been looking ahead to Phillies future since prior to the All-Star break. This week the Arizona Fall League rosters were announced. This gives us a glimpse into some of what the Phils may be thinking regarding 2015 and beyond. Tommy Joseph was the top catching prospect in the Phillies system, but he has had multiple health issues the last few seasons which may leave an opening for Logan Moore. Unfortunately Moore's offensive output has been light (.226 /.290/.339 combined A & AA in 2014). On the plus side he has spent the majority of the season in Reading which is up a level for his age. The Phillies entire minor league system appears pretty soft, and catcher is no exception. When the time comes to replace Carlos Ruiz, I am not sure the answer will be Cameron Rupp, Tommy Joseph or Logan Moore. If he is adequate defensively Logan Moore may be able to contribute at the Major league level simply because he is a left-handed hitting catcher. This will help him get a nod as a platoon backup and situational pinch hitter. The Phillies will send seven players to their AFL rep, the Scottsdale Scorpions. Joining Moore will be Pitchers Ryan O'Sullivan, Colton Murray, Nefi Ogando, and Ethan Stewart, along with Shortstop Roman Quinn (BA #10 Phillies Prospect). The final spot is TBA. Other than Quinn, there doesn't appear to be a lot to get excited about in that list. Hopefully one of the pitchers will find themselves during the fall and can emerge as a 2015 prospect. 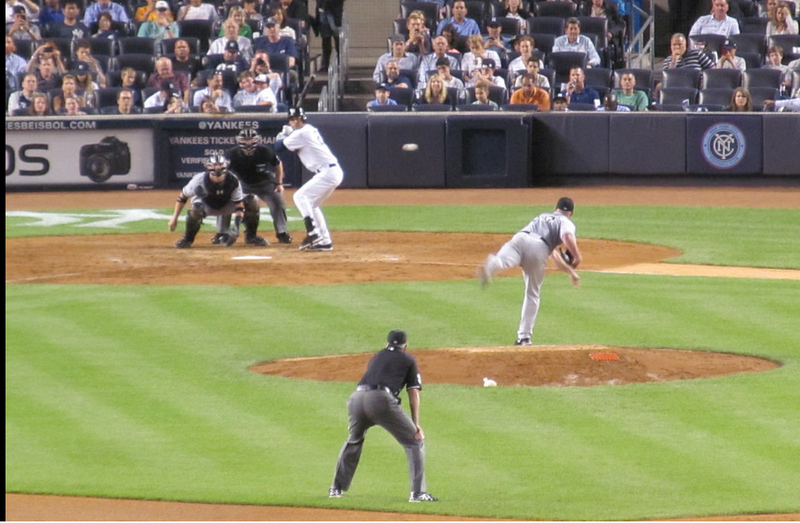 Team Phungo took a road trip to New York this past weekend to catch what is likely our last Derek Jeter home game. We may have been there to see the Captain but the evening belonged to Martin Prado. The veteran super utility player got both a Home Run and a Walk off single accounting for 3 of the Yankees runs in the 4-3 victory. Jeter went 1-5 in the game with the ht being a single. 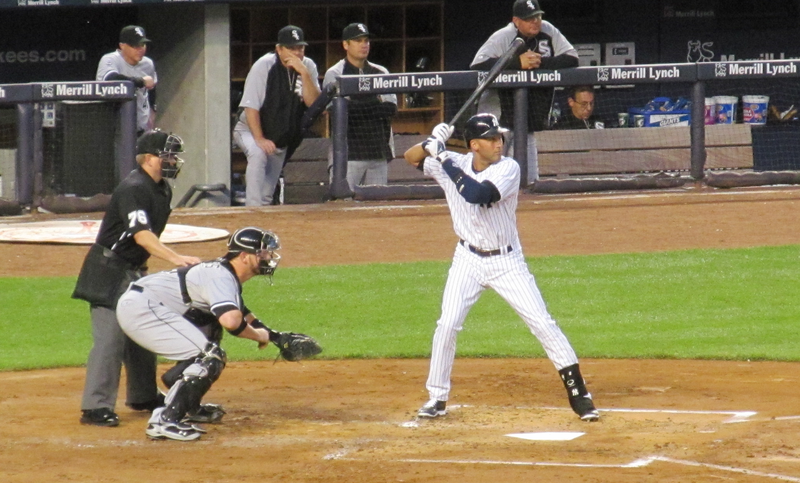 Regardless the Yankees crowd was glad to see him play and showed their appreciation. The Three White Sox runs came courtesy of a Home Run by Cuban Rookie of the Year candidate Tony Abreu. 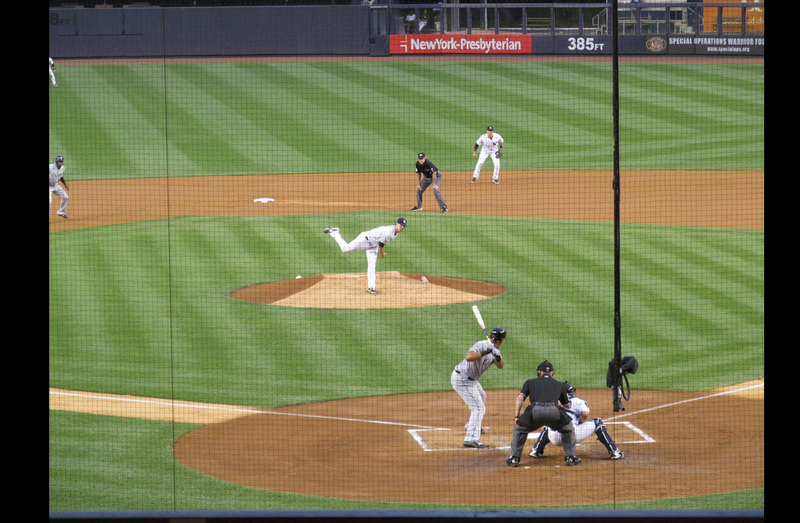 The photo above is of the pitch upon which Abreu hit is homer. The ball just cleared the wall in left center. Greene settled down after a miserable first inning and was able to pitch into the 6th. We didn't sit there much but our tix were int he CF bleachers. It was a fun atmosphere for a game. We had an obstructed view that kept us from seeing Left Field, but it to allow me to take some ok shots of the action at the plate. The Yankees retired Joe Torre's #6 the day after our game, so I imaging Friday night was the last time that the Retired number board had "only"17 numbers displayed. Ryan Howard did connect with a Double in his 1-4 night which pretty much made him the Phillies offensive star on a rather dismal night for the squad. 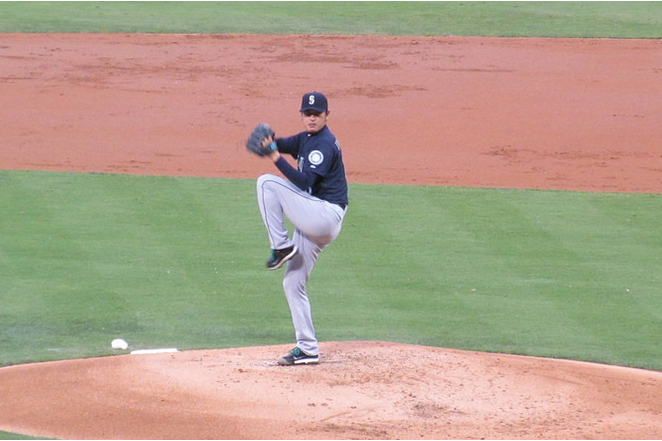 Credit has to be given to the Mariners starting pitcher Hisashi Iwakuma who is having an incredible season. He pitched 8 innings struck out 11 while walking NONE and yielding only 4 hits, Howard's double and three singles. For the season Iwamura is posting a very healthy 10.0 K/BB ration (120-12). A year ago Iwakuma led the AL in Pitchers WAR. The Tuesday night start by AJ Burnett put him over some sort of Game Started Threshold that netted the veteran more coin then Team Phungo takes home in a year. 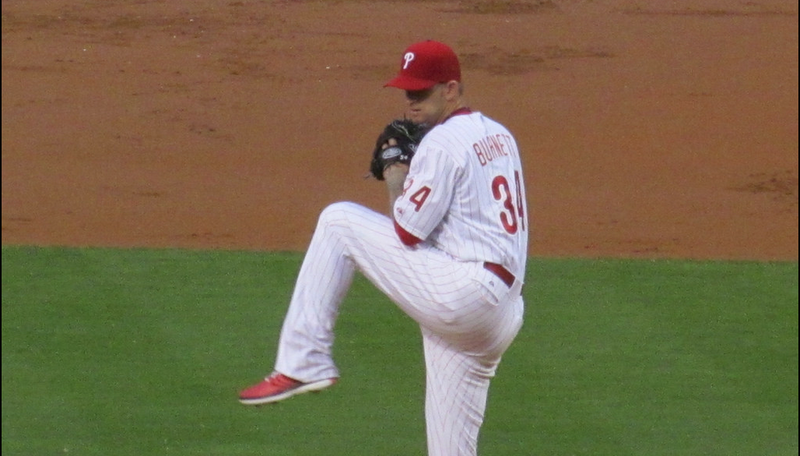 Postgame it was revealed that Burnett mentioned that he doubts he will pitch in 2015. 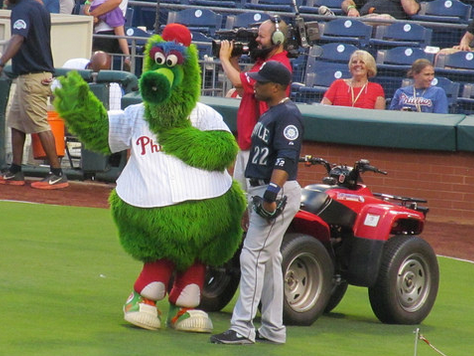 The Phanatic gives Robinson Cano some pointers. I was watching a rebroadcast of the game (Team Phungo is a glutton) and Tom McCarthy mentioned that Cano gave Phillies coach Larry Bowa a Rolex Watch as a thank you gift for all the help that Bowa had given Cano while both were with the Yankees. 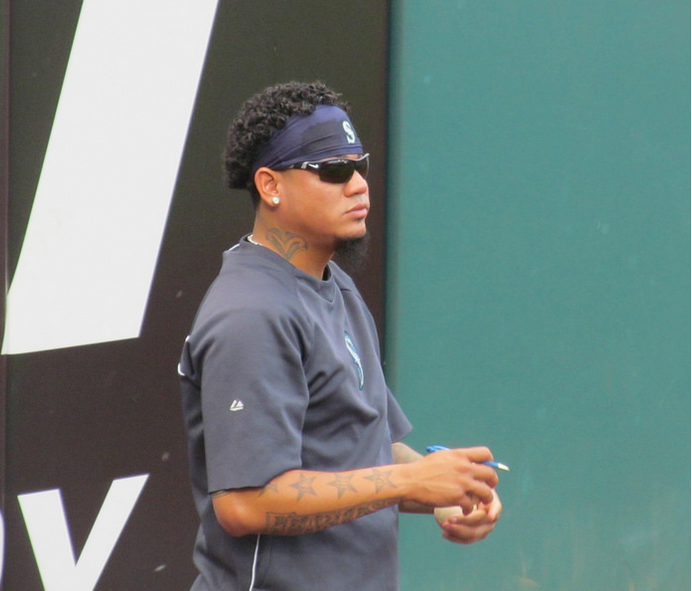 Good Guy Award goes out to Felix Hernandez who signed A TON of autographs. 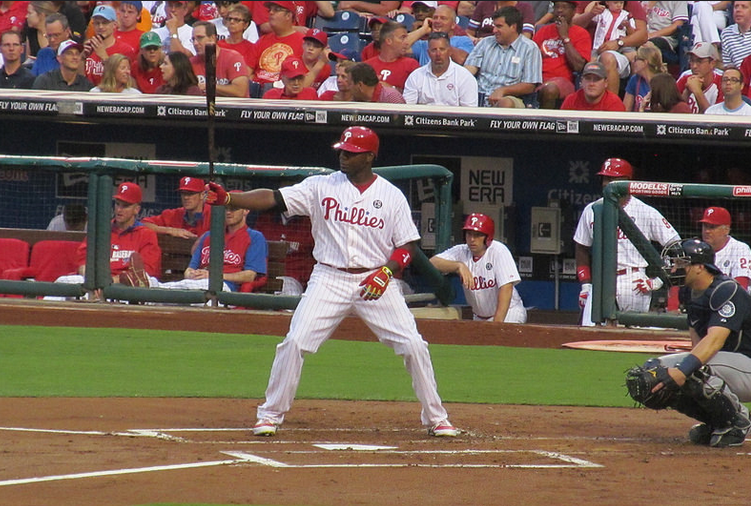 Other GGAs for The Phillies Cody Asche and the Mariners Fernando Rodney. Several of the Mariners signed a couple of autographs. Pretty good for a club that is right on the edge of the playoff hunt. Princeton Alum Chris Young also appeared to hosting some local fans and invited them down on the field for BP. Just wanted to note that the Ryan Howard comes with a busted bat, which seems pretty appropriate. A few seasons ago every Phillies game was a sellout and Bobble Head nights were a particularly tough ticket. This week they Honored one of their biggest starts the Phillies drew less than 32 thousand fans. 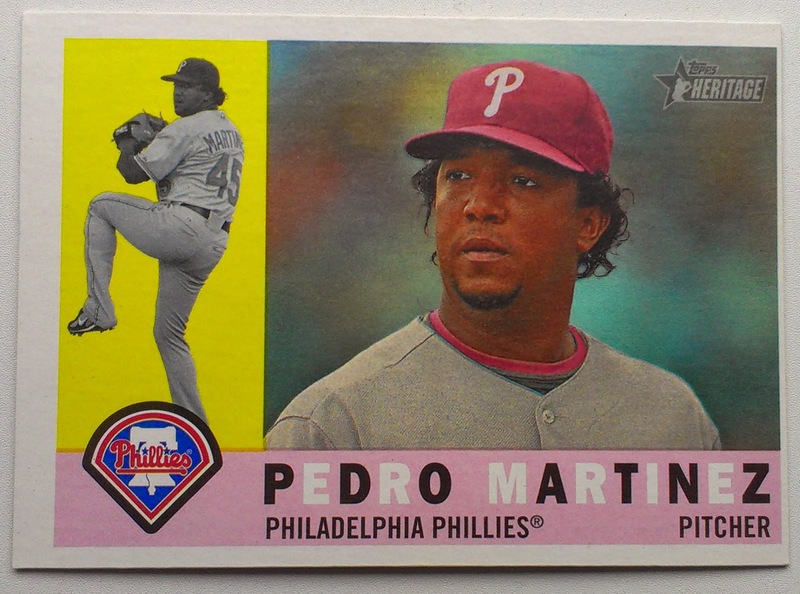 A few weeks ago we discussed the Hall of Fame qualifications of Pedro Martinez. While Pedro did play for the Phillies, I elected to present a Red Sox Card in the post. He played for several clubs beyond the Sox and Phils but to me he is part of Red Sox Nation. Tonight we return to Pedro and post him as a Phil. 2009 Heritage homages the horizontal 1960 Topps Set which also features two photos. The large color photo is a portrait while the smaller black & whilte photo is a non-game "in action" shot. On this card I believe that both of these pix are likely photoshopped. 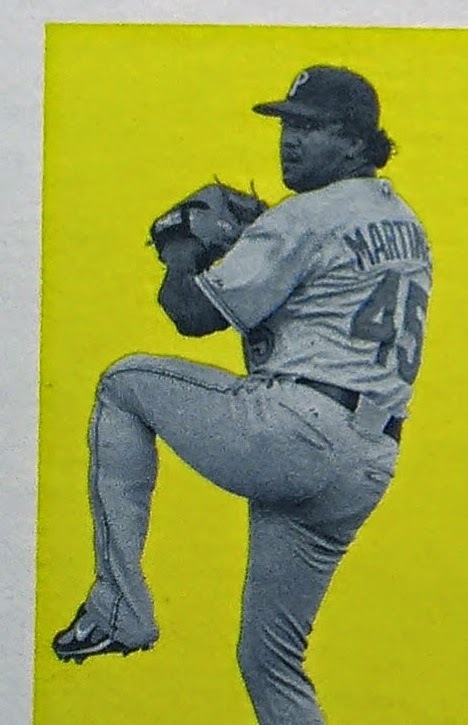 Martinez only pitched a dozen times for the Phillies - I forgive Topps for not getting a pix of him in a real live Phils Jersey. The front number is fine on a Mets jersey. However that isn't the csse with a Phillies uniform - To my knowledge the Phillies don't carry a number on the A-side of any of their current jerseys. I don't think this is a photoshop disaster, just an oddity you find out about when you look at too many cards. For tonight's Sunday Night Baseball feature we are posting the 2nd installment of our 2015 HoF candidates. 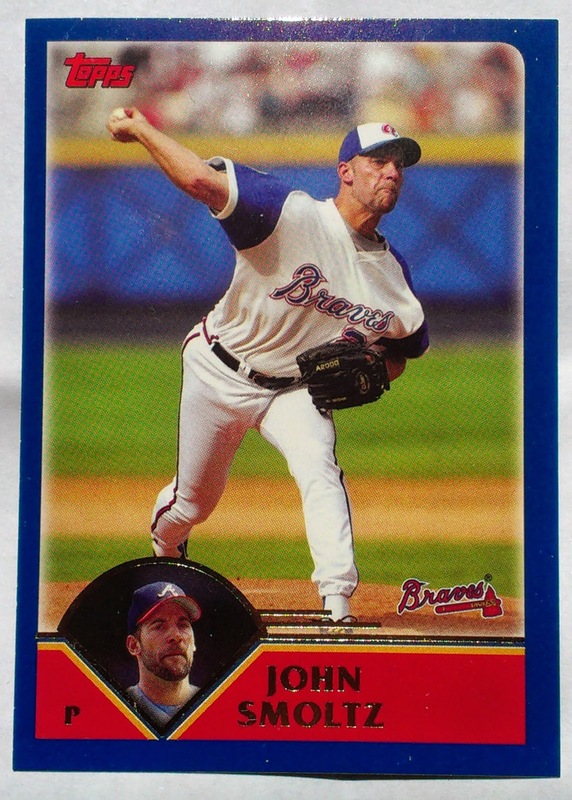 With the Braves hosting the Nats we turn to John Smoltz. The HoF case for John Smoltz is interesting. Due to a career arc that moved him to the closer role Smoltz is pretty unique in the history of the game. Despite only starting five games over a 5 year period (2000-2004) Smoltz still found time to win 213 games. In addition to that big number Smoltz won a World Series (1995) and collected a Cy Young award. He was a member of 8 All-Star teams and started the 1996 game that was hosted by the Phillies. Smoltz Advanced stats numbers give him a little trouble. The four years he spent closing likely hurt Smoltz career WAR numbers. His 69.5 WAR number is a few ticks below the Average for HoF candidates. That number puts Smoltz above Jim Palmer, Don Sutton, Juan Marichal and Don Drysdale. It also puts him below Non-Haller Rick Reuschel. There is a significant third aspect to Smoltz's HoF resume - His Postseason numbers. The man was 15-4 in 209 playoff innings. His ERA in those game was a very solid 2.67. HoF - This is a pretty easy one for me. Even with the baseball world turning towards SABRmetrics I think the BBWAA will agree and put John Smoltz in the Hall on Ballot One. The overall career numbers coupled with the World Series Ring and Smoltz's dominant postseason numbers make for a pretty strong case. In addition I think the BBWAA will look favorably upon Smoltz for being able to accept any role to help the team. I love this card. In general I think 2003 Topps is underrated. The rich colors throughout the set work and I like the profile pix in the lower corner which echoes 1983 Topps, another Phungo favorite. Beyond that I am a fan of cards with the throwback unis. The Braves Hank Aaron era throwback meshes well with the set color scheme. HoF card for a HoF player. The photo on this card was taken in the 9th inning of a Braves 5-3 victory over the Phillies on July 27, 2002. 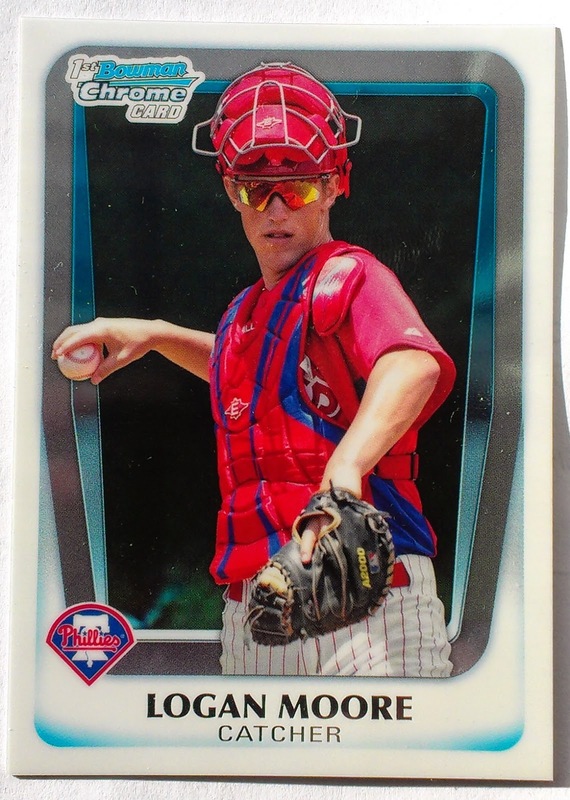 There are couple of Phillies and Braves cards in 2003 Topps that have the throwbacks, not all of these can be attached to the July 27th game as the teams wore the unis for all 3 games of the weekend series. The 7/27 and 7/28 games were both day games while Friday 7/26 was played at night. We were able to pin down the Smoltz card as the middle game on Saturday as it was the only time he pitched in the series. 20017 0727: The Pix paragraph was added, Sources and Links reconfigured. Yeah I am way behind on this quick hit review but I am going to publish it anyway. Picked up a Rack Pack and a single of 2014 Topps A&G a few weeks back. These are the Highlights. 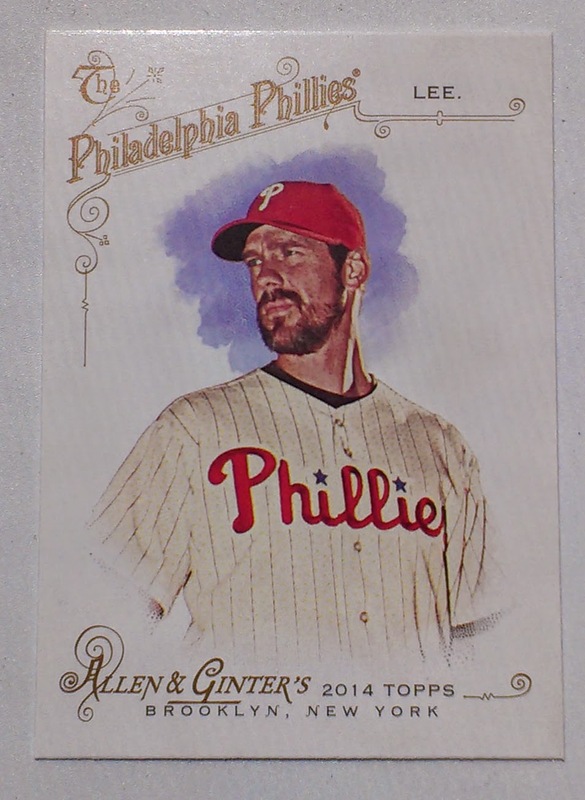 Decent Design, still says Ginter but it just different enough form other sets to keep it interesting. The Team Name dwarfing the player name is a bit jarring. This is a departure from prior A&G designs. For most part past A&G designs have not featured team names. In 2011 a square team logo was displayed on each card. Lee was the only Phillies player I got in the bounty. I don't remember how many cars I picked up in the packs. I am thinking 24. Close to half of them were Hall of Famers. 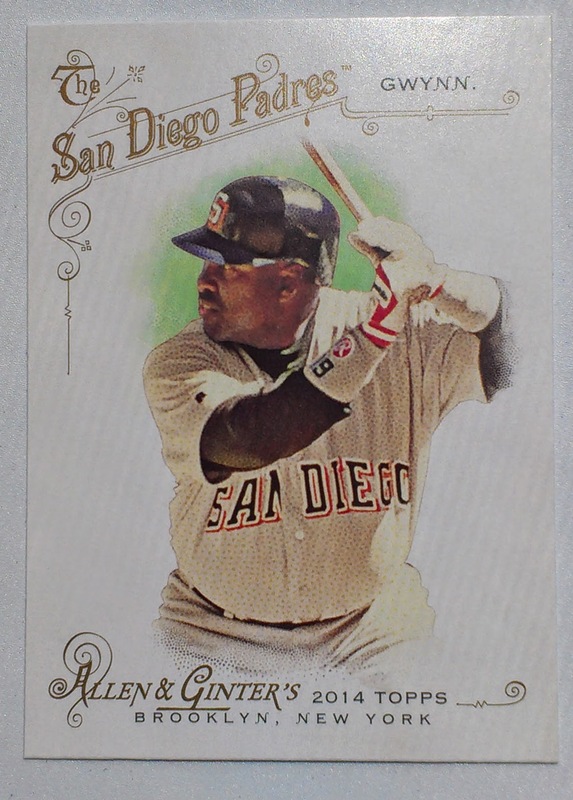 This is probably my favorite out of those - Pulling a card of the recently deceased Tony Gwynn brought a pang of sadness to me. I have a pretty solid HoF cards collection and these are nice additions. I like the classic Braves uni on Hammerin' Hanks card. Minis are always a highlight of AnG. The Carew and Wacha cards are both members of the 3 card special border pack that comes inside rack packs. Massaccio was a painter, the image Topps used is directly from wikipedia - glad I spent $3 on that pack. 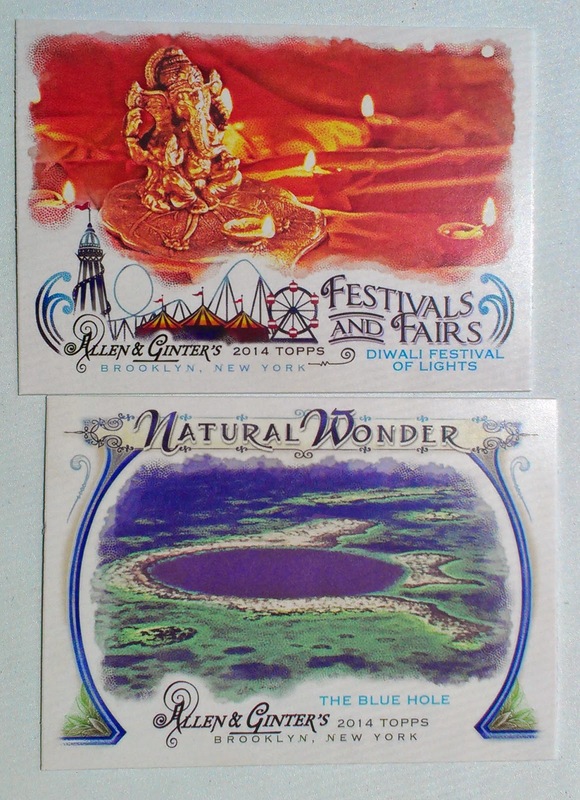 I think this is the 2014 A&G common insert. The B-sides lists the players hobbies - Trout collects baseball cards, Nolan runs a baseball team. 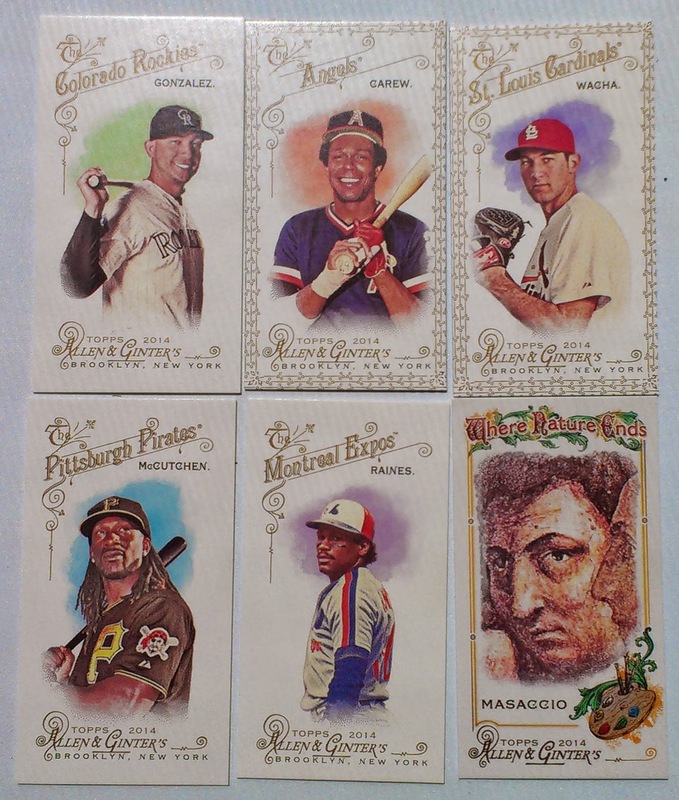 Some of the non-baseball cards in this year's set. Here we have the one time Queen of England and an actress from "Buffy the Vampire Slayer"
At the outset A&G inserts were always minis, not so much anymore. Neither of these do anything for me, maybe if I see some of these other members of these sets I will change my mind, but both of these are losers. A quick post that allows me to continue complaining about the Phillies lack of youth movement. This week the Houston Astros are in town which gives us the opportunity to cover Jose Altuve. Jose Altuve is having a breakout year. He is leading the league in Batting Average, Hits and Stolen Bases. Offensively, I think Altuve's output is what the Phillies would like to see from outfielder Ben Revere. At 24 the Astros 2nd baseman is in his 4th major league season yet he is younger then the entire Phillies Roster outside of Cody Asche and Rookie Ken Giles. Contrast that with the Astros who have 6 of their 8 starters under the age of 25. I should really dislike this card, This is my least favorite Topps design. 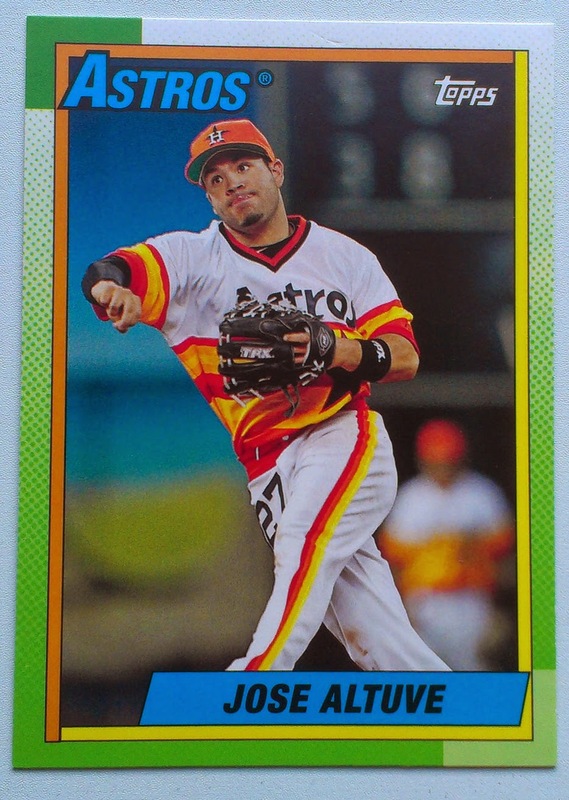 In addition I am not a fan of the Astros 1970s/80s rainbow unis. They may be for some folks, but not me. Strangely the combination, the bright threads and the bright green border work well together. The orange yellow inner border also contributes. It doesn't appear this color combo was used a lot in the original set. The inner boarder appears to be across most Astros cards but the outer border varies with the green not be really common. Veteran pitcher Jim Clancy's #648 card carried this combo, unfortunately he isn't wearing the colorful rainbow Jose Altuve is sporing. 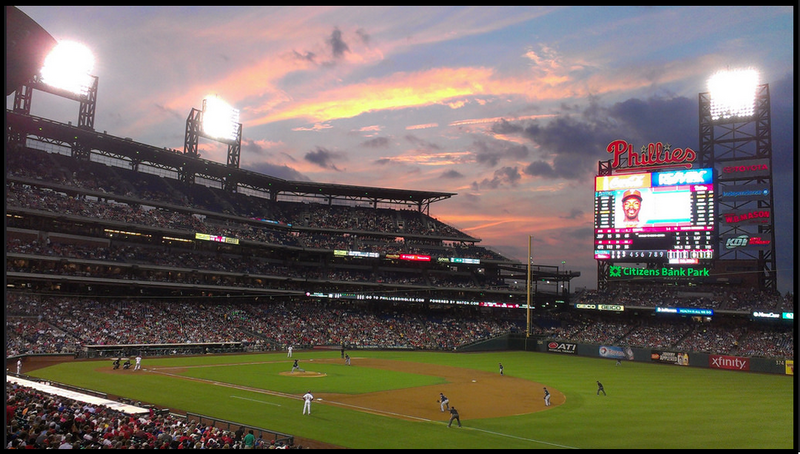 There are dozens of disappointments in the Phillies 2014 season. The recent call by the Cubs of Javier Baez reminds us that the Phillies future looks bleak as well. September Call Ups are looming but the Phillies have no one near the caliber of Baez in their system. At AAA this season the Cubs future second baseman or shortstop has knocked out 23 Homers along with 24 doubles. His BA is an ok .260 with a very respectable .510 slugging number. This is a followup to a 2013 season where Baez hit 37 Homers across 2 levels. 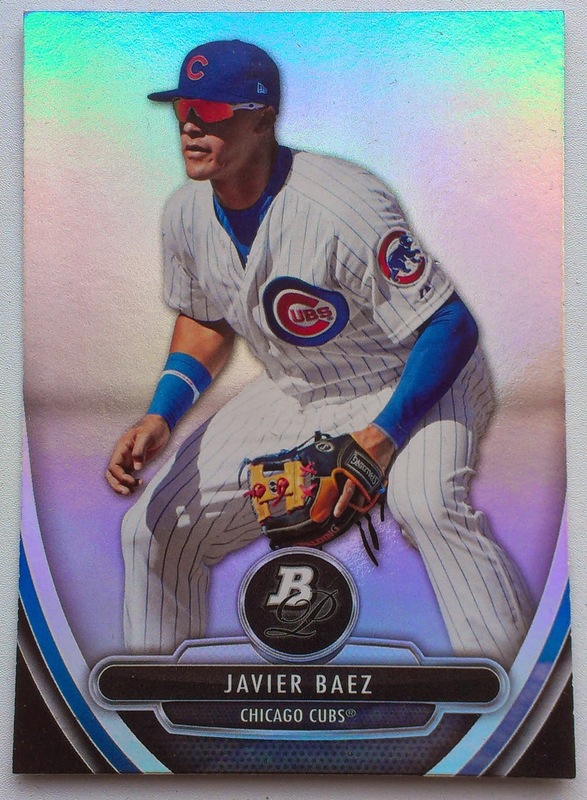 We don't know what the future holds for the 21 year old Javier Baez. 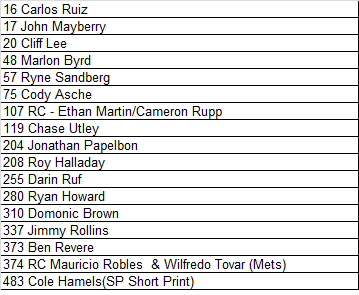 We do know that prior to the season 3 different prospect ranking services placed Baez in the Top 10. There is no Phillies that were held in such high regard - Maikel Franco drew rankings ranging from #17 to #52, Jesse Biddle #53 - #94. Neither has had a good 2014, although Franco has played well for the last month. 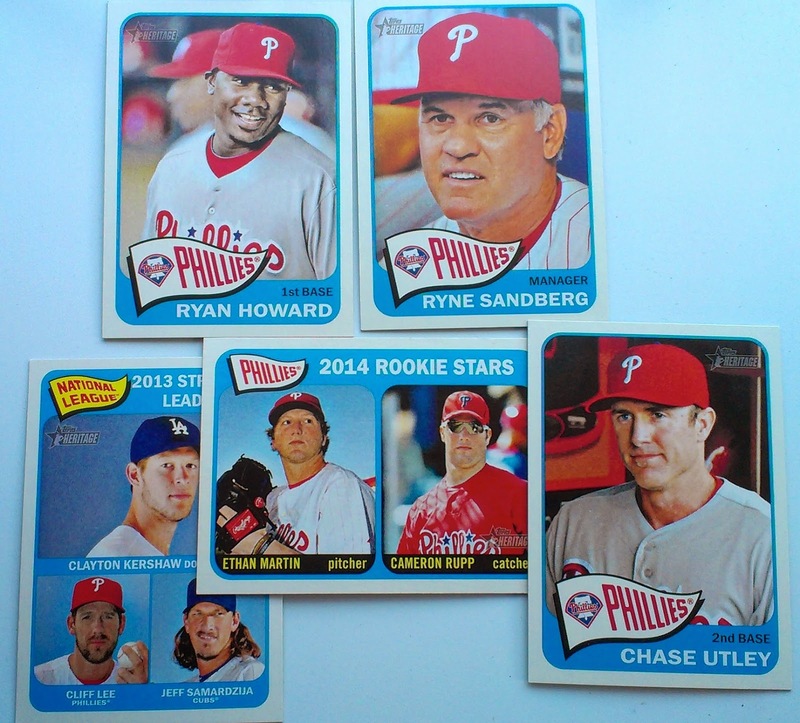 As the Phillies turn the page to 2015 hopefully some prospects emerge and we can post a Bowman Card of a Phillies player next year. 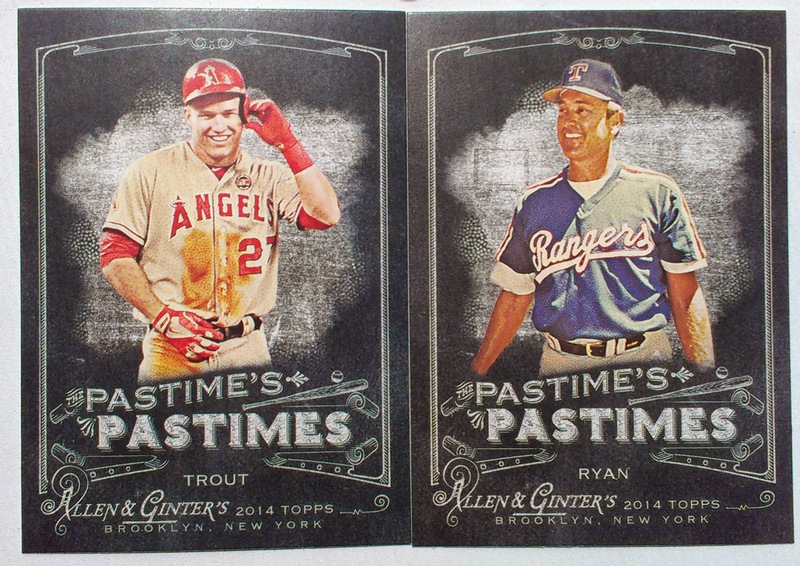 Topps Heritage is designed to homage an original Topps set from decades ago. There are several items that Heritage nods towards in replicating the originals. one of the obvious ones is replicating the design. A second is giving attention to the Checklist. Tonight I would like to take a look at how the Phillies 2014 Checker compares with the original from 1965. That is a solid checker for the Phillies. 17 cards featuring 18 players. You would have to dig deep to find a snub, Pitchers AJ Burnett who came to the team late or Kyle Kendrick would be the closest. Carding Mayberry and Ruf could be seen as questionable. Halladay is either an honorarium or laziness on Topps part. The original 1965T Phils team set checked 29 players on 27 cards (2 rookie pairs) plus a team card and the Gene Mauch manager card. 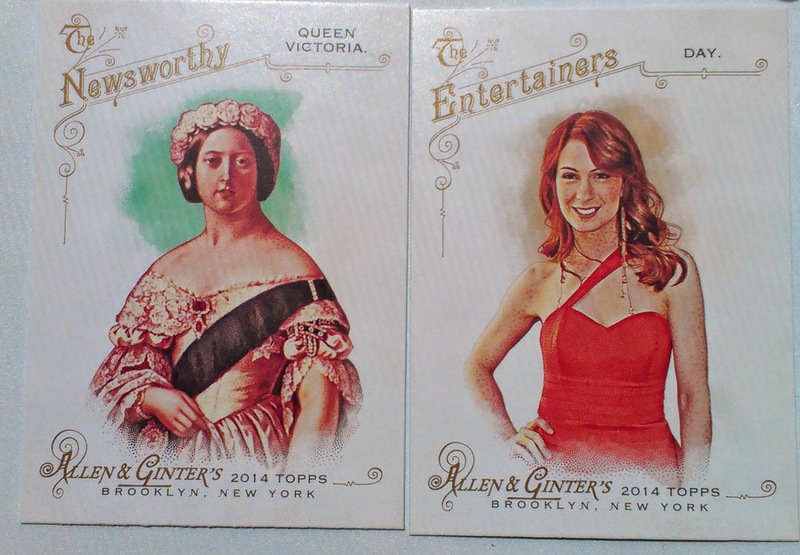 For 2014 Heritage, Topps chose to rhyme four subjects with the original set. This is a good pair, Bunning is a low tier Hall of Famer. Cliff Lee is an All-Star with significant Postseason exposure. These two match on match on position, both were power hitters and both won World Series Rings - although Stuart won his with the Pirates. In fact on his 1965T card Stuart appears to be wearing Pirates threads. In addition to the similarities above the two share a reputation of poor play in the field, a rep that earned Stuart the nickname Dr StrangeGlove. These two share a position and both were reigning All-Stars at the time of set production. Callison made 3 all-star games. At this point in his career Dom Brown's all-star selection appears it could be a one and only despite the outfielder being only 26. Tonight we take over our intermittent Sunday Night Baseball postings with our Hall of Fame ballot feature. In 2014 we made it through 10 candidates - This year we are starting a bit sooner, hopefully we hit more of the ballot. With the Red Sox hosting the Yankees yet again on the big E, it seems like a very appropriate time to look at Pedro Martinez. 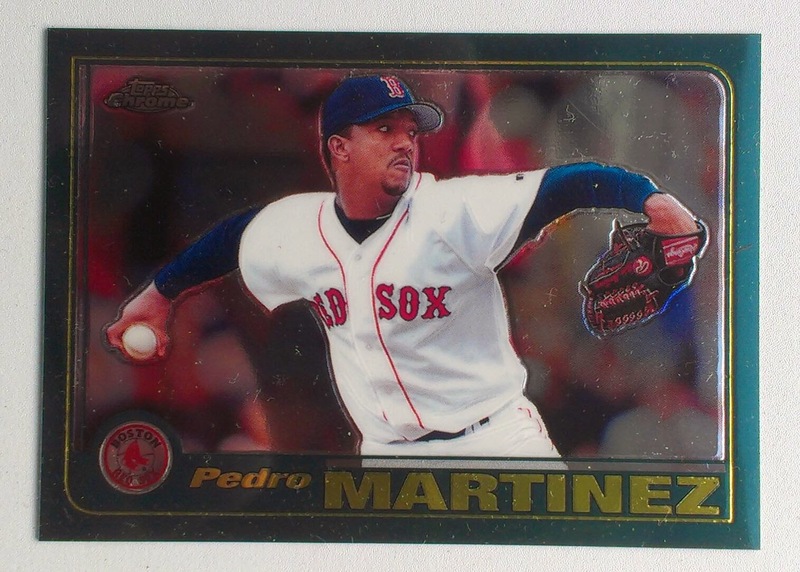 Pedro took the mound for five different teams in his career, including a dozen starts with the 2009 Phillies but to me he will always be a member of the Boston Red Sox. The HoF resume for Martinez is pretty solid, Curse busting World Series Ring, 3 Cy Young Awards, Eight time All-Star, A W/L record 100+ games over .500. He won 5 ERA titles and his 3154 Strikeouts are 13th all-time. For the cool kids Martinez 86.0 career WAR ranks 17th all time. Everyone ahead of him is Either in the Hall or on the ballot. Despite the fact he lost the Game 6 of the 2009 World Series. Pedro remains one of my favorite players. He was the rare player who wanted the ball, believed he would deliver and then would - the notable exception was of course his last couple of starts with the Phillies. I found him to be pure theater on and off the mound from much of his career and he gets a Thumbs Up on the Phungo HoF ballot.